I’ve realized that I’ve been posting a lot of Barrier Canyon Style photos lately (well, they are my favorite ones), so here’s a look up at one of the many petroglyph panels in Shay Canyon. 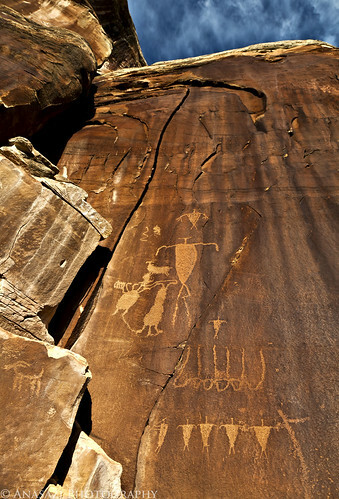 These are believed to be Anasazi, but there are certainly figures in the area the look Fremont, too. Shay Canyon contains quite a few excellent petroglyph panels that are easy to access and great to explore, which are also very well preserved. When I visited Shay Canyon earlier this year, the sky was overcast almost the whole time, but shortly before I left the area there were a couple of small breaks in the clouds. This was one of the few photos I got that included some blue sky that day.